Yesterday, I talked about living in the moment. When you focus on the past or the future obsessively, you get stressed. And stress is such a buzz kill! Nothing will bring you down quicker than feeling stressed out. It keeps you from sleeping well, staying productive, and getting in a good mood. You can pretty safely conclude that reducing stress increases happiness. 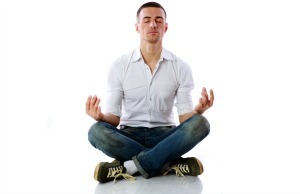 One of the best ways to bring your stress levels down and increase your joy is to mediate. In addition to reducing stress and increasing happiness, meditation is good for your health, helps you practice self-awareness, and it strengthens your concentration. If you’re new to meditating, let me give you a quick primer on this ancient technique of clearing the mind. Meditation is a state of thoughtless awareness. It’s reached by practicing meditating, until we can reach that state of mind easily and effortlessly. Along the way meditation will help us gain more control over our mind and our thoughts. There are all sorts of different ways to practice mediation. Some will have you focus on your breathing, some will have you focus on your body. You can practice in complete silence, while listening to white noise or soft music, or guided meditations. There are some moving meditations, such as yoga or tai chi, that I’ve found helpful when my mind needs extra help to calm down. If you’re new to meditating, a simple guided meditation may be your best bet. There are plenty of recordings online, on YouTube, and even on apps. Some of them will be free, while others are paid guided meditations. Listen to a few of them until you find a mediation you’re comfortable with. If you want to just give this a try without downloading or buying any guided meditations, give this basic meditation exercise a try. Set a timer for one minute – that’s all! Start by laying down comfortably on your back. Have your hands on the side and relax. Close your eyes, and breathe naturally. Notice how the breath moves your body and try to focus on mind on each exhalation and inhalation. If you mind starts to wander, count slowly to 4 while breathing in and again while breathing out. When you notice mind chatter, bring attention back to your breath. Aim for a few minutes of meditation to begin with. Don’t feel bad if you find yourself nodding off. Meditation can be very relaxing and a great way to help you get to sleep. With practice you will be able to mediate for longer periods of time. Remember that practicing meditation is like exercising: you need to start with small amounts, then work up. Experiment with techniques and lengths of mediation until you find your own routine that reduces stress, increases happiness and is something you can stick with for the long run. Keep practicing meditation to keep up your happiness levels, and maybe even boost them!